(for example acetaldehyde, ketone (for example acetone etc. ), ether family (dimethyl ether, diethyl ether etc. ), gasoline, aromatics (for example benzene, toluene, xylene etc. ), alkane (for example methane, butane, pentane, hexane, propane, heptane, octane, etc. ), acetylene and butadiene. Amongst LFLs, alcohol (methanol, ethanol, propanol, and butanol) fuels have actually been used throughout history so they really aren’t a novelty. ALcohol-based fuels (dimethyl ether, diethyl ether) have been gaining rapid interest in the last decades given they contribute to a more environmentally sustainable shipping industry, through lower emissions levels and the potential for fuel production from renew-able feedstocks and energy source. Alcohol and alcohol-based fuels are extremely suitable as fuels given their high octane numbers i.e. high knock resistance. Air inlet temperatures reach around 400 degree Celsius, higher than in the case of diesel as methanol fuel blend converts to vapor. Effective piston pressure spikes, coupled with the blend’s self combustibility (high octane number) allows complete buring of fuel i.e. improved fuel economy. However, use of LFLs in bulk quantities, particularly in harsh environments such as heated engine rooms, requires greater safety measures. The additional safety measures are nonetheless outweighed by the advantages. 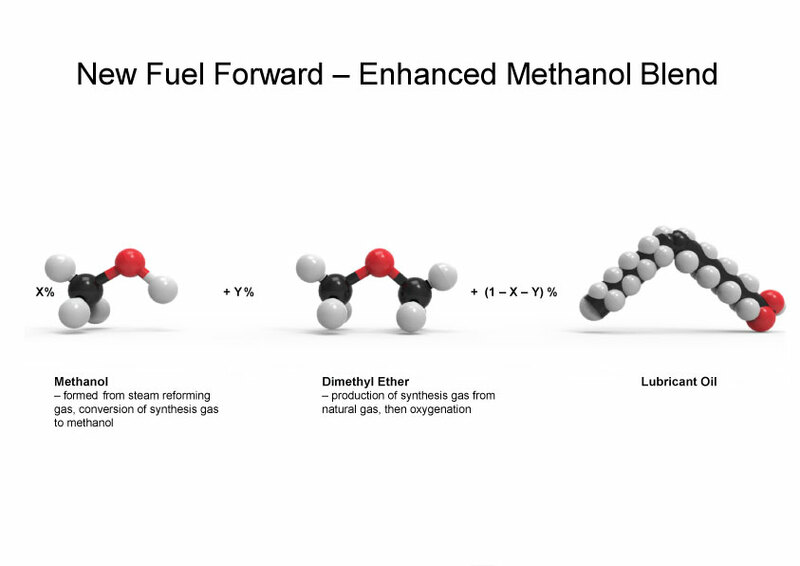 In addition to improved fuel economy, the costs of deriving, transporting and storing methanol is way more straight forward than other green alternatives. While they do require additional safety precautions, Billion Miles offers a simple one-time solution that will fit any required retrofit for any engine/vessel/fleet. Gasoline Refined from crude oil 90 – 95 N.A. LNG No conversion required 120 N.A.